Plant a tree in memory of Clarence D.
Be the first to share your favorite memory, photo or story of Clarence D.. This memorial page is dedicated for family, friends and future generations to celebrate the life of their loved one. Clarence D. Hromadka, age 84, of Bagley, passed away on Friday, January 18, 2019, at Atrium Post Acute Care in Lancaster. He was born on February 15, 1934, in Crawford County, the son of James and Christina (Mezera) Hromadka. Clarence graduated from Patch Grove High School in 1953. He was drafted into the United States Army and was stationed in Germany. Clarence served his country until his honorable discharge in 1957. Following his honorable discharge, Clarence was employed at Dubuque Packing Company. He was united in marriage to Phyllis Jean Pitz. 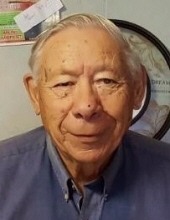 Clarence was an avid outdoorsman; he enjoyed hunting, trapping, fishing, and gardening. Clarence also enjoyed playing cards and dancing. He was a member of St. Mary's Catholic Church in Bloomington. Survivors include his children: Joanne Hromadka; Debra (Joseph) Kohn; Diane (Chris) Dolan; Cindy (Joe Hatfield) Hromadka; Jim (Pam Ackerman) Hromadka; grandchildren: Melissa, Matthew, Jon, Heather, and Ryan; one great-grandson; his brother, Robert (Karen) Hromadka; a sister-in-law, Theresa Hromadka; former wife, Phyllis Jean Hromadka; other relatives and many friends. In addition to his parents, Clarence was preceded in death by a daughter, Julie Hromadka; his siblings: Grace in infancy; Josephine (James) Dustko; James (Helen); Raymond (Winifred); Elmer Hromadka; Myrtle (Russ) Grimm; and Lawrence Hromadka. A Mass of Christian Burial will be held on Friday, January 25, 2019, at 11:00 a.m. at St. Mary's Catholic Church in Bloomington with Father John Meinholz officiating. Burial with military honors will be in St. Mary's Cemetery, Bloomington. Family and friends may call on Friday from 9:30 a.m. until time of services at the church. Martin Schwartz Funeral Home & Crematory in Bloomington is serving the family. To plant a tree in memory of Clarence D. Hromadka, please visit our Tribute Store. Military Honors will be held at the cemetery following the graveside service. "Email Address" would like to share the life celebration of Clarence D. Hromadka. Click on the "link" to go to share a favorite memory or leave a condolence message for the family.